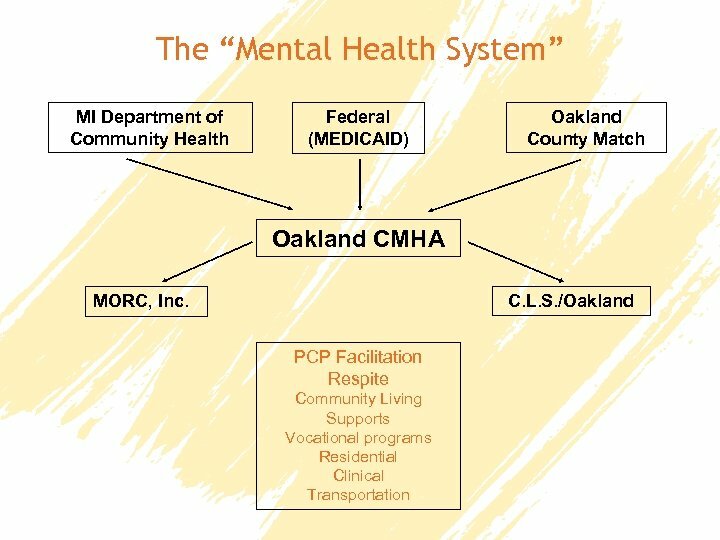 Related to the Mental Health System (continued) • Probate Court 1. 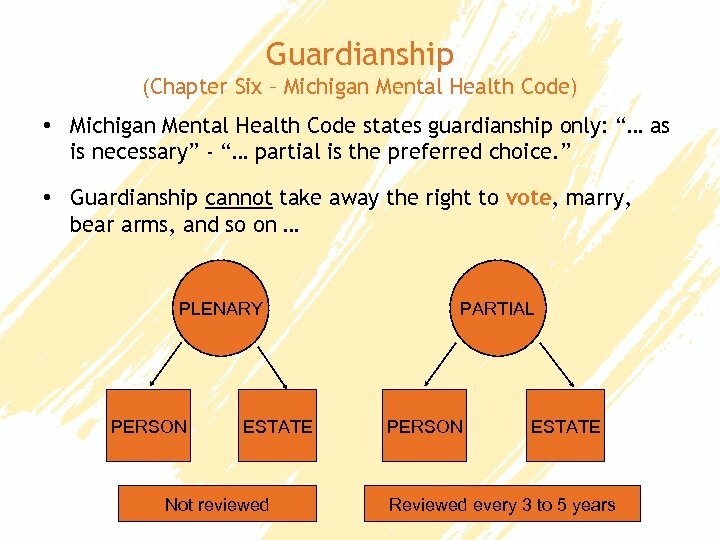 Guardianship (developmental disabilities) 2. Decedent’s Estates • Education-Vocational and Transition 1. School District 2. 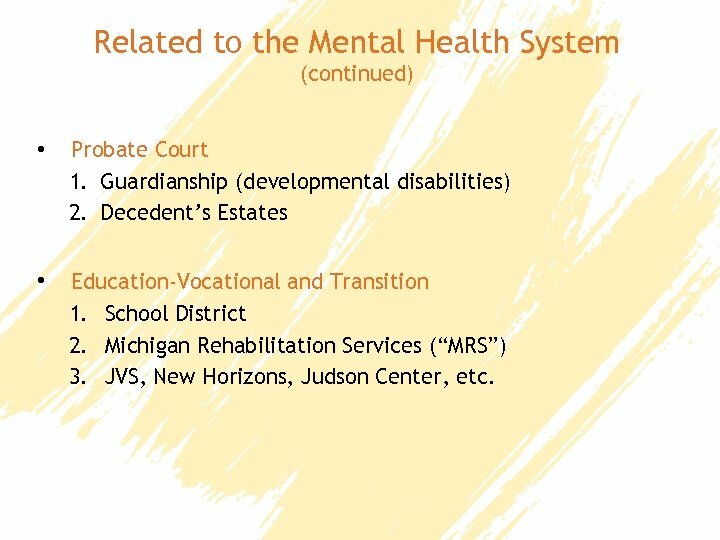 Michigan Rehabilitation Services (“MRS”) 3. JVS, New Horizons, Judson Center, etc. 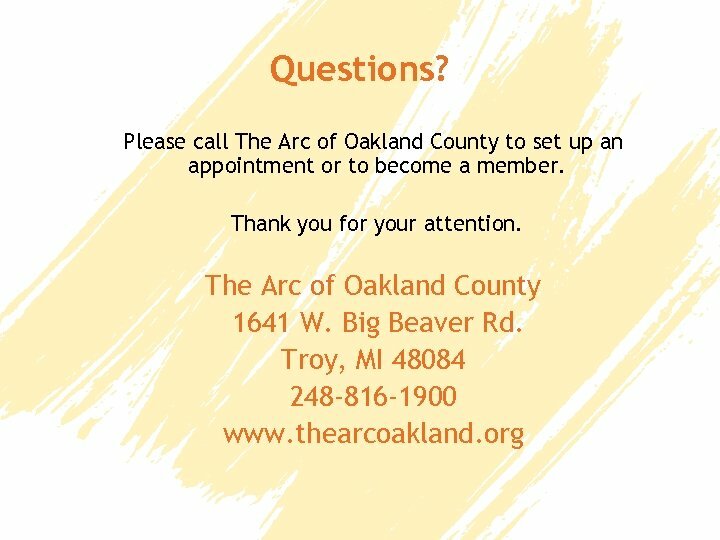 Information about The Arc of Oakland County Contact Information: • Address: The Arc of Oakland Co. 1641 W. Big Beaver Road Troy, MI 48084 -3501 • Telephone: 248 -816 -1900 • Fax: 248 -816 -1906 • E-Mail: [email protected] org (Tom) [email protected] org (Katie) • Website: www. thearcoakland. 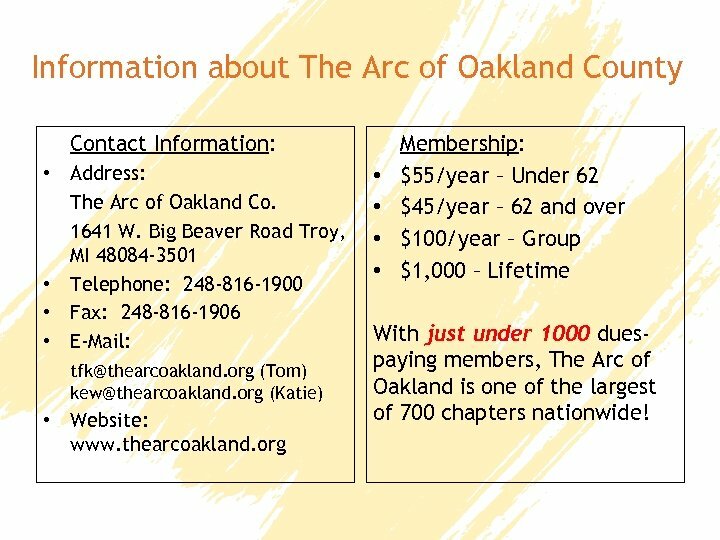 org • • Membership: $55/year – Under 62 $45/year – 62 and over $100/year – Group $1, 000 – Lifetime With just under 1000 duespaying members, The Arc of Oakland is one of the largest of 700 chapters nationwide! 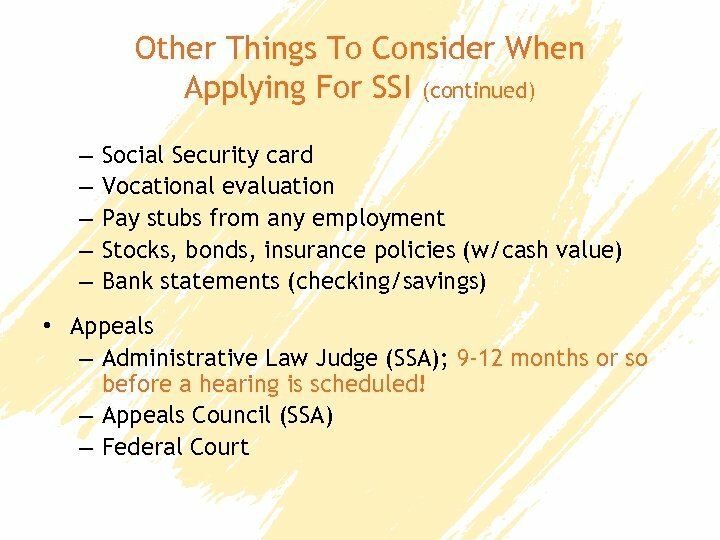 Basic Requirements For Becoming Eligible For Supplemental Security Income (SSI) 1. Can’t have liquid assets over $2, 000; and, 2. 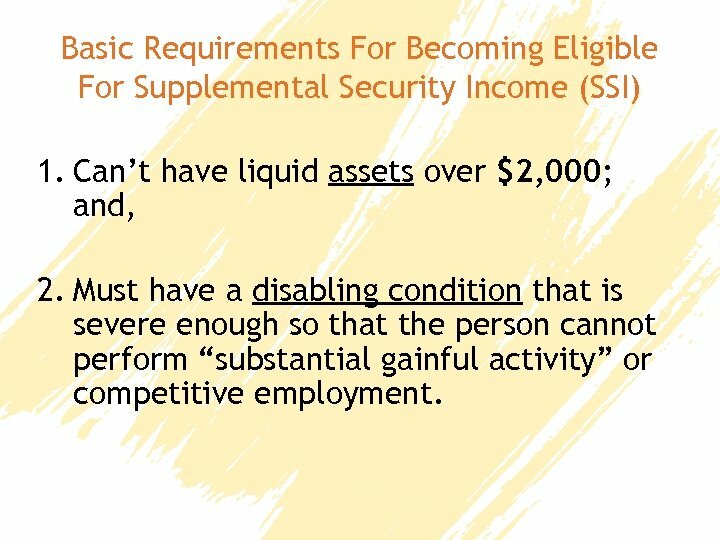 Must have a disabling condition that is severe enough so that the person cannot perform “substantial gainful activity” or competitive employment. 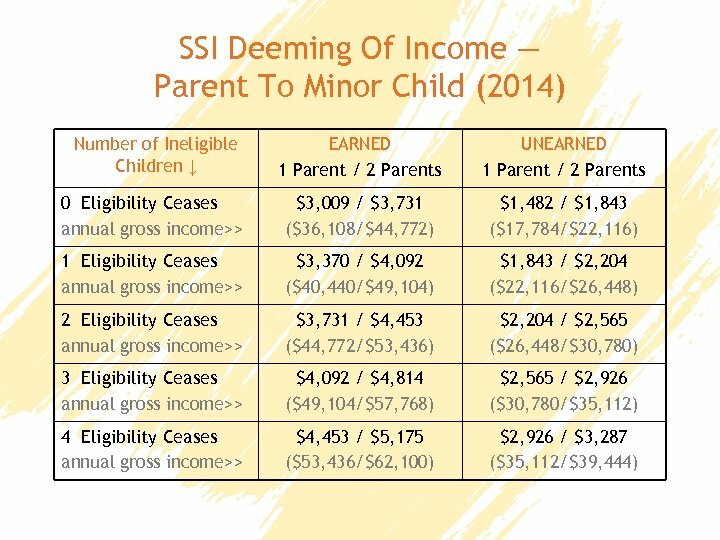 SSI Deeming Of Income (continued) The Previous Chart Does Not Apply When … • The parent(s) receives both earned income (e. g. , wages or net earnings from self-employment) and unearned income (e. g. , Social Security benefits, pensions, unemployment, interest income, and State disability). • The parent(s) receives a public income maintenance payment such as Temporary Assistance for Needy Families (TANF), or a needs-based pension from the Department of Veterans Affairs. • The parent pays court-ordered support payments. • The child has income of his/her own. • Any ineligible child has income of his/her own, marries, or leaves the home. • There is more than one disabled child applying for or receiving SSI. 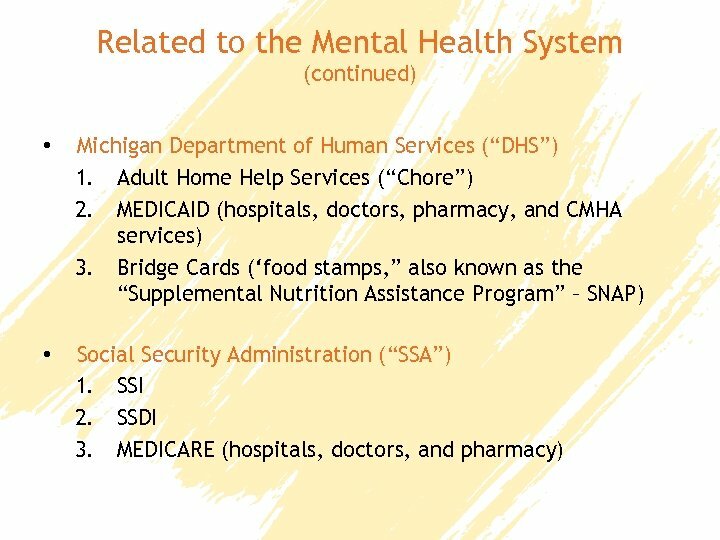 • The State supplements the Federal benefit (---not in Michigan!). 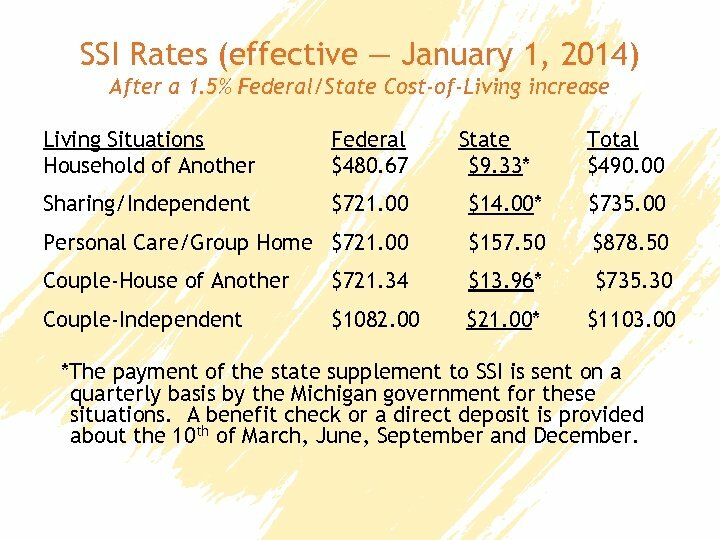 SSI Rates (effective — January 1, 2014) After a 1. 5% Federal/State Cost-of-Living increase Living Situations Household of Another Federal $480. 67 State $9. 33* Total $490. 00 Sharing/Independent $721. 00 $14. 00* $735. 00 Personal Care/Group Home $721. 00 $157. 50 $878. 50 Couple-House of Another $721. 34 $13. 96* $735. 30 Couple-Independent $1082. 00 $21. 00* $1103. 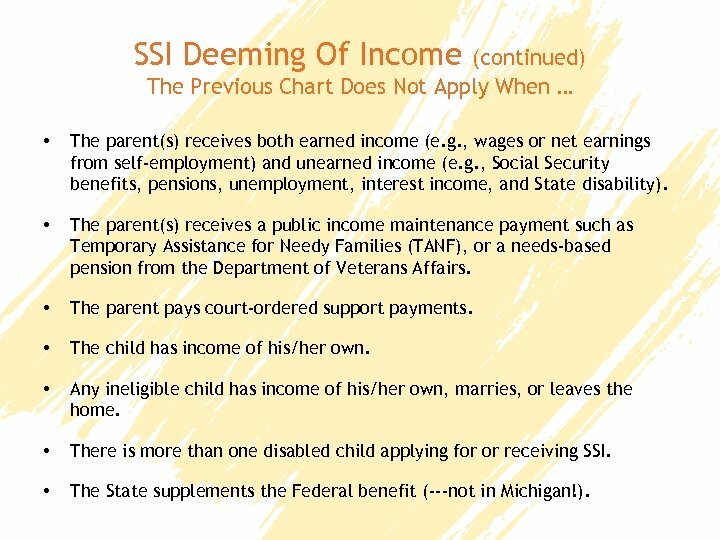 00 *The payment of the state supplement to SSI is sent on a quarterly basis by the Michigan government for these situations. A benefit check or a direct deposit is provided about the 10 th of March, June, September and December. 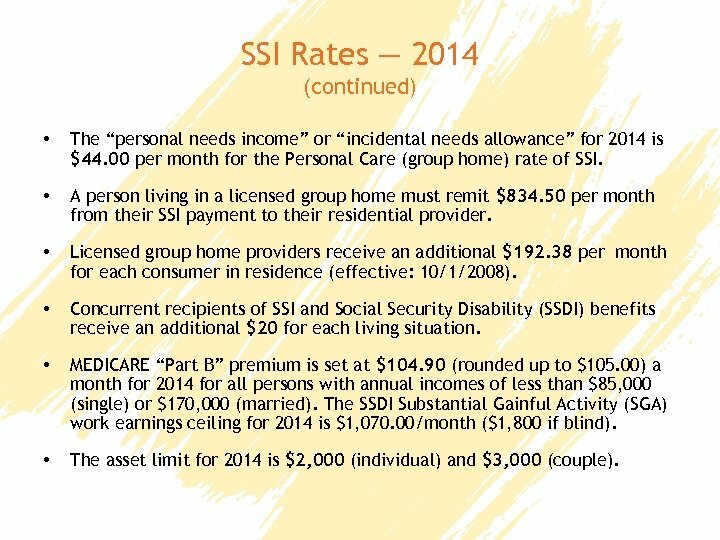 SSI Rates — 2014 (continued) • The “personal needs income” or “incidental needs allowance” for 2014 is $44. 00 per month for the Personal Care (group home) rate of SSI. • A person living in a licensed group home must remit $834. 50 per month from their SSI payment to their residential provider. • Licensed group home providers receive an additional $192. 38 per month for each consumer in residence (effective: 10/1/2008). • Concurrent recipients of SSI and Social Security Disability (SSDI) benefits receive an additional $20 for each living situation. • MEDICARE “Part B” premium is set at $104. 90 (rounded up to $105. 00) a month for 2014 for all persons with annual incomes of less than $85, 000 (single) or $170, 000 (married). The SSDI Substantial Gainful Activity (SGA) work earnings ceiling for 2014 is $1, 070. 00/month ($1, 800 if blind). • The asset limit for 2014 is $2, 000 (individual) and $3, 000 (couple). 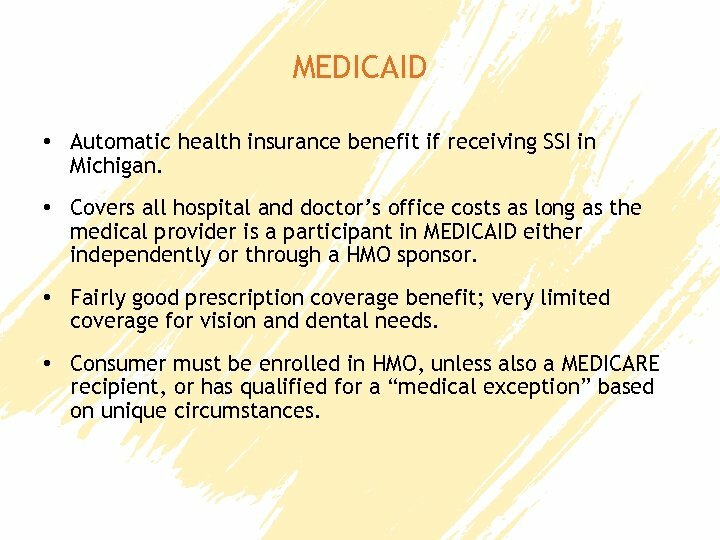 MEDICAID • Automatic health insurance benefit if receiving SSI in Michigan. • Covers all hospital and doctor’s office costs as long as the medical provider is a participant in MEDICAID either independently or through a HMO sponsor. • Fairly good prescription coverage benefit; very limited coverage for vision and dental needs. • Consumer must be enrolled in HMO, unless also a MEDICARE recipient, or has qualified for a “medical exception” based on unique circumstances. 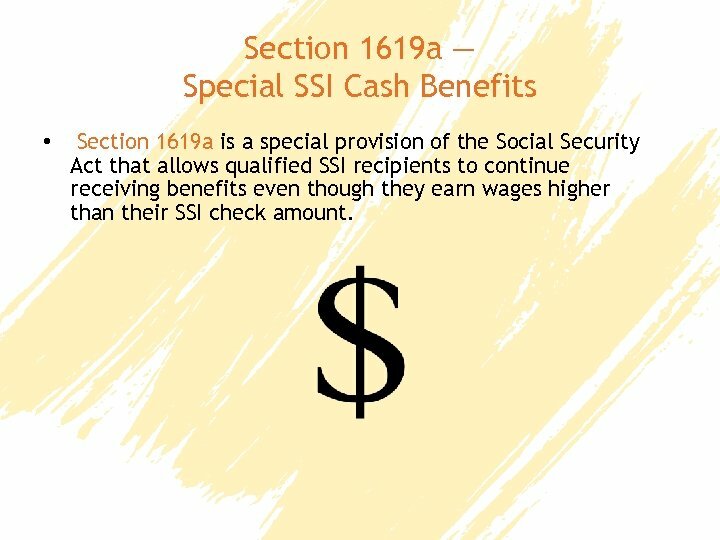 Section 1619 a — Special SSI Cash Benefits • Section 1619 a is a special provision of the Social Security Act that allows qualified SSI recipients to continue receiving benefits even though they earn wages higher than their SSI check amount. 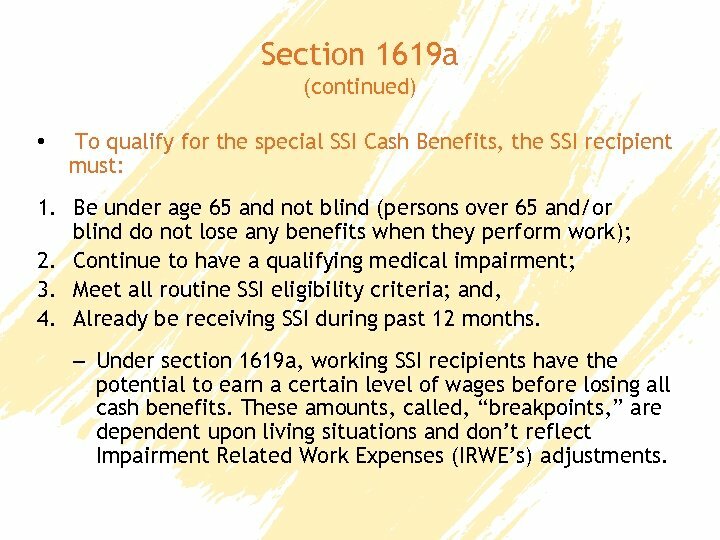 Section 1619 a (continued) • To qualify for the special SSI Cash Benefits, the SSI recipient must: 1. Be under age 65 and not blind (persons over 65 and/or blind do not lose any benefits when they perform work); 2. 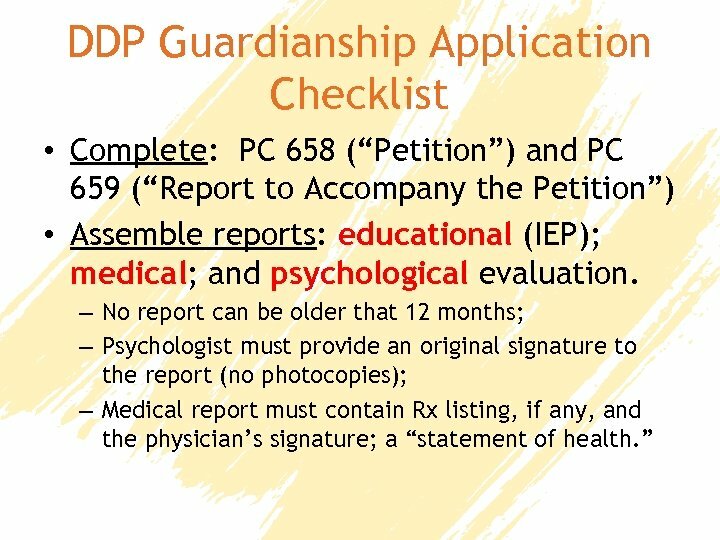 Continue to have a qualifying medical impairment; 3. 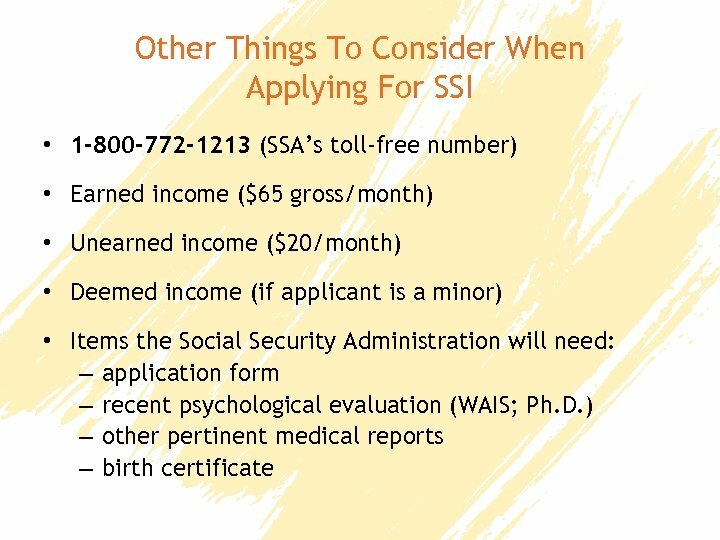 Meet all routine SSI eligibility criteria; and, 4. Already be receiving SSI during past 12 months. 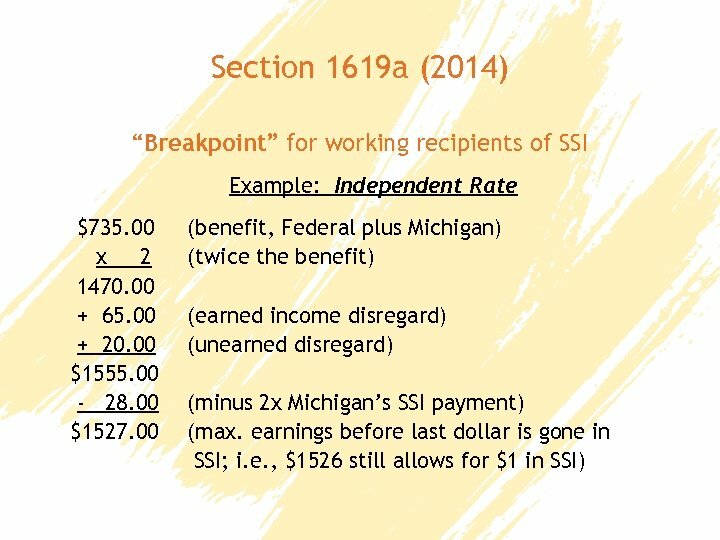 – Under section 1619 a, working SSI recipients have the potential to earn a certain level of wages before losing all cash benefits. 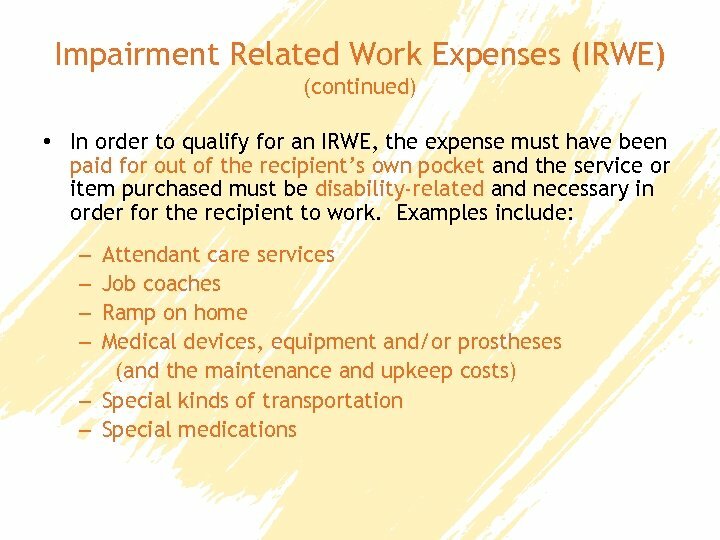 These amounts, called, “breakpoints, ” are dependent upon living situations and don’t reflect Impairment Related Work Expenses (IRWE’s) adjustments. 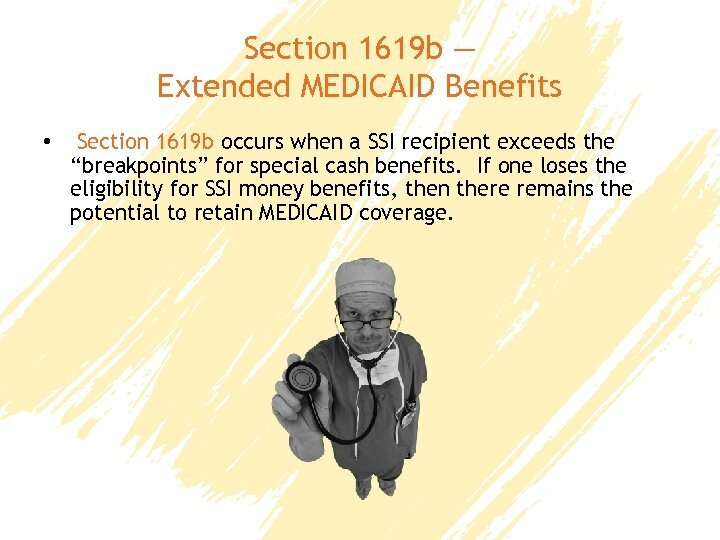 Section 1619 b — Extended MEDICAID Benefits • Section 1619 b occurs when a SSI recipient exceeds the “breakpoints” for special cash benefits. 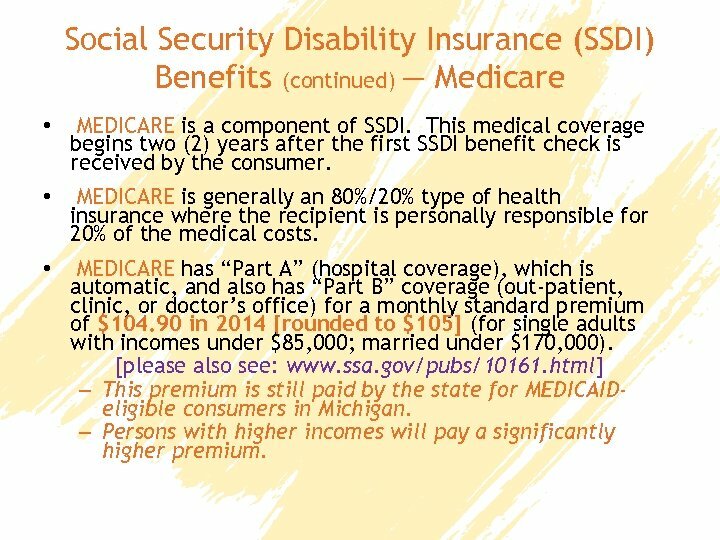 If one loses the eligibility for SSI money benefits, then there remains the potential to retain MEDICAID coverage. 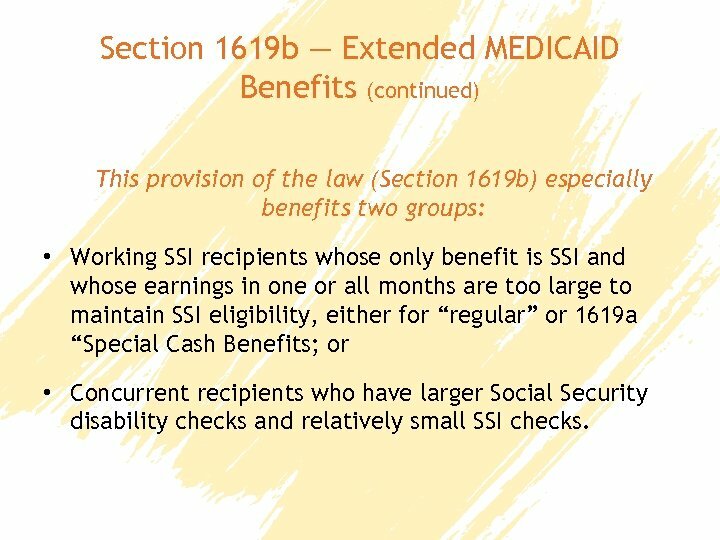 Section 1619 b — Extended MEDICAID Benefits (continued) This provision of the law (Section 1619 b) especially benefits two groups: • Working SSI recipients whose only benefit is SSI and whose earnings in one or all months are too large to maintain SSI eligibility, either for “regular” or 1619 a “Special Cash Benefits; or • Concurrent recipients who have larger Social Security disability checks and relatively small SSI checks. 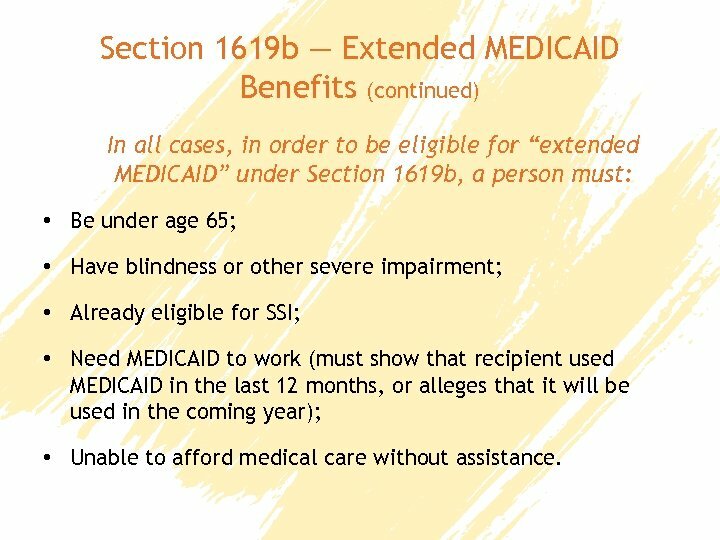 Section 1619 b — Extended MEDICAID Benefits (continued) In all cases, in order to be eligible for “extended MEDICAID” under Section 1619 b, a person must: • Be under age 65; • Have blindness or other severe impairment; • Already eligible for SSI; • Need MEDICAID to work (must show that recipient used MEDICAID in the last 12 months, or alleges that it will be used in the coming year); • Unable to afford medical care without assistance. Section 1619 b — Extended MEDICAID Benefits (continued) Threshold Amount (2014) The inability to afford medical care without assistance is a requirement in order to receive extended MEDICAID benefits under Section 1619 b. There exists a formula developed by the SSA that results in a maximum amount of gross earnings where even the SSI extended MEDICAID benefits will cease. In Michigan for 2014, it is $34, 260 ($33, 517. 00 for 2013). 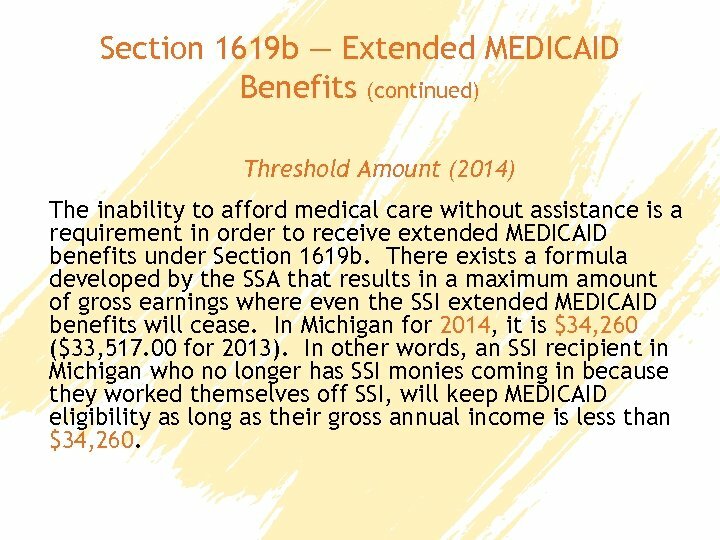 In other words, an SSI recipient in Michigan who no longer has SSI monies coming in because they worked themselves off SSI, will keep MEDICAID eligibility as long as their gross annual income is less than $34, 260. Social Security Disability Insurance (SSDI) Benefits There are four ways to receive SSDI: 1. 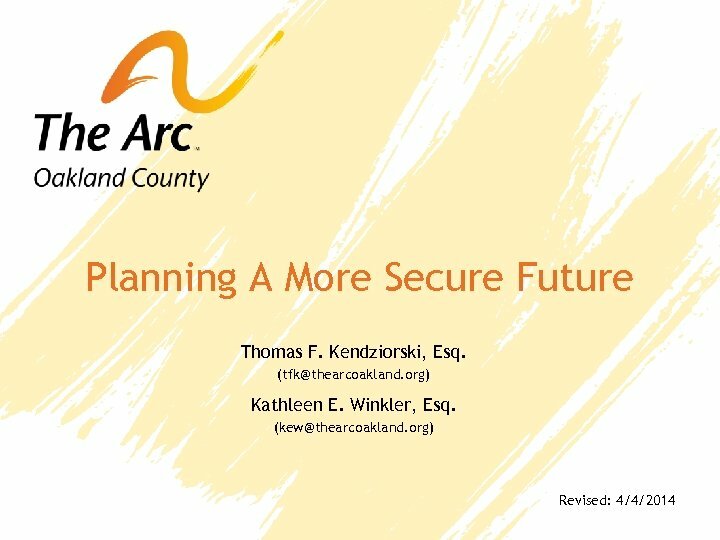 Work and pay into the Social Security Administration (SSA) system through F. I. C. A. over a period of time known as “credits” or formerly, “quarters of earnings. ” 2. 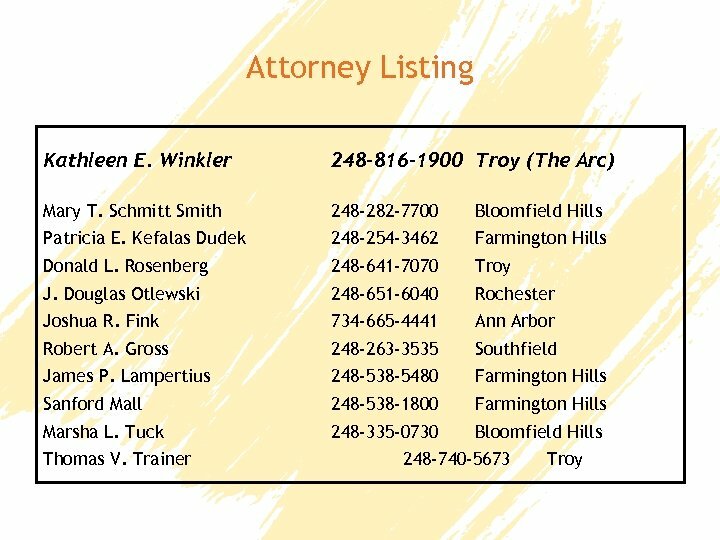 Insured parent through SSA is disabled. 3. Insured parent through SSA is retired, over 62, and receiving SSA pension. 4. Insured parent is deceased. Social Security Disability Insurance (SSDI) Benefits (continued) — Medicare • MEDICARE is a component of SSDI. This medical coverage begins two (2) years after the first SSDI benefit check is received by the consumer. • MEDICARE is generally an 80%/20% type of health insurance where the recipient is personally responsible for 20% of the medical costs. • MEDICARE has “Part A” (hospital coverage), which is automatic, and also has “Part B” coverage (out-patient, clinic, or doctor’s office) for a monthly standard premium of $104. 90 in 2014 [rounded to $105] (for single adults with incomes under $85, 000; married under $170, 000). [please also see: www. ssa. gov/pubs/10161. html] – This premium is still paid by the state for MEDICAIDeligible consumers in Michigan. – Persons with higher incomes will pay a significantly higher premium. 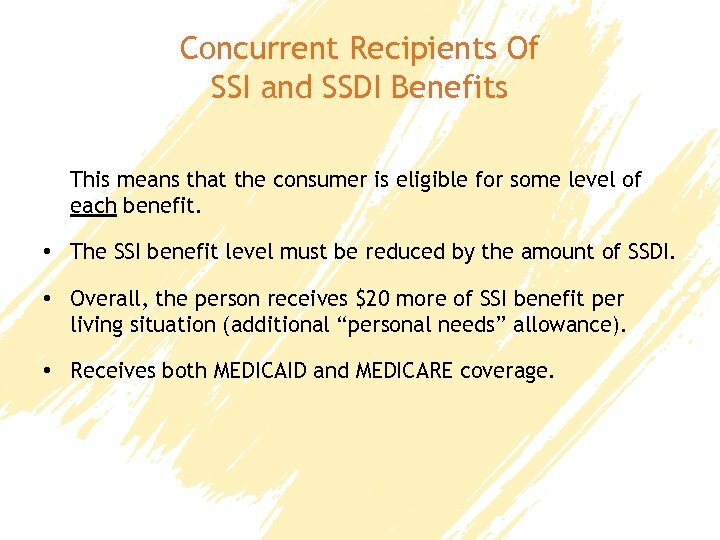 Concurrent Recipients Of SSI and SSDI Benefits This means that the consumer is eligible for some level of each benefit. 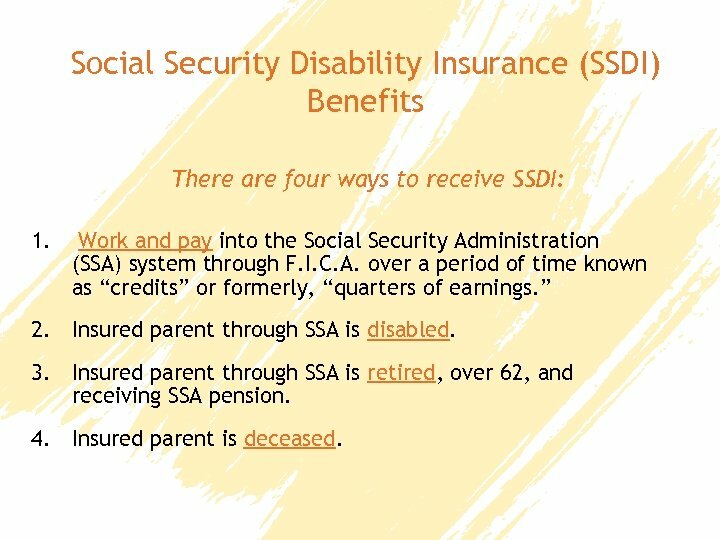 • The SSI benefit level must be reduced by the amount of SSDI. • Overall, the person receives $20 more of SSI benefit per living situation (additional “personal needs” allowance). • Receives both MEDICAID and MEDICARE coverage. 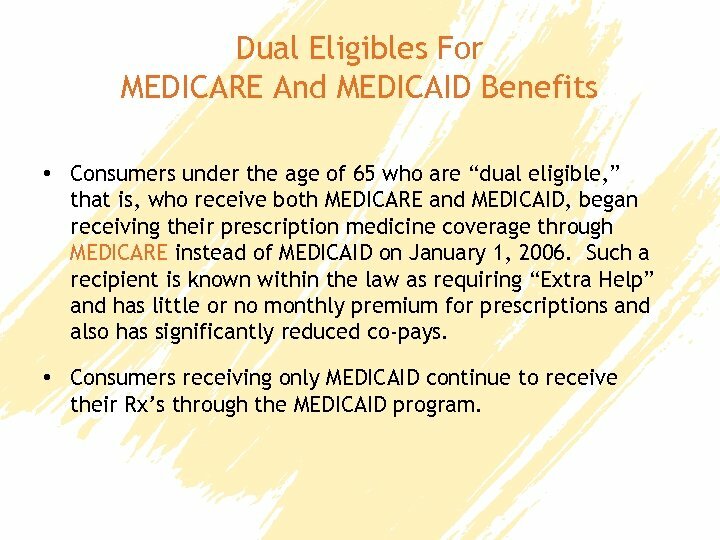 Dual Eligibles For MEDICARE And MEDICAID Benefits • Consumers under the age of 65 who are “dual eligible, ” that is, who receive both MEDICARE and MEDICAID, began receiving their prescription medicine coverage through MEDICARE instead of MEDICAID on January 1, 2006. Such a recipient is known within the law as requiring “Extra Help” and has little or no monthly premium for prescriptions and also has significantly reduced co-pays. • Consumers receiving only MEDICAID continue to receive their Rx’s through the MEDICAID program. 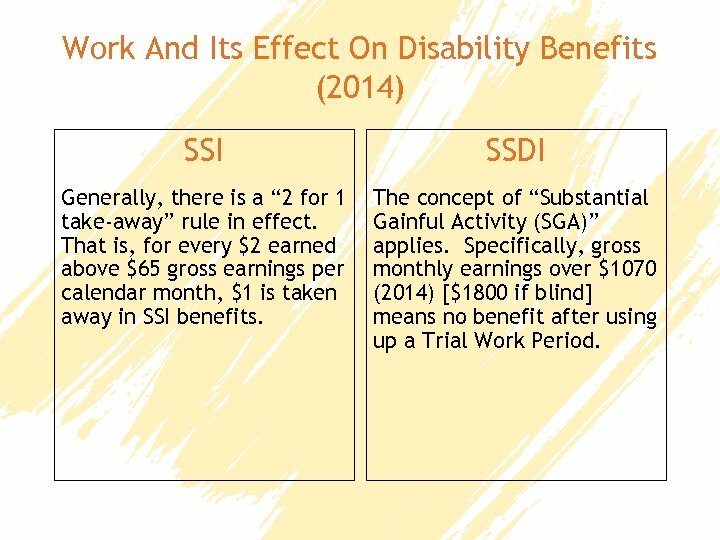 Work And Its Effect On Disability Benefits (2014) SSI SSDI Generally, there is a “ 2 for 1 take-away” rule in effect. That is, for every $2 earned above $65 gross earnings per calendar month, $1 is taken away in SSI benefits. The concept of “Substantial Gainful Activity (SGA)” applies. Specifically, gross monthly earnings over $1070 (2014) [$1800 if blind] means no benefit after using up a Trial Work Period. 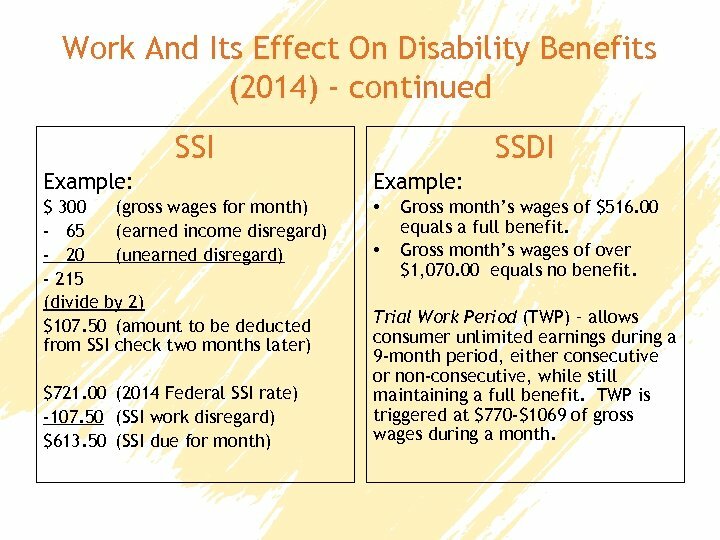 Work And Its Effect On Disability Benefits (2014) - continued SSI SSDI Example: $ 300 (gross wages for month) - 65 (earned income disregard) - 20 (unearned disregard) - 215 (divide by 2) $107. 50 (amount to be deducted from SSI check two months later) • $721. 00 (2014 Federal SSI rate) -107. 50 (SSI work disregard) $613. 50 (SSI due for month) • Gross month’s wages of $516. 00 equals a full benefit. Gross month’s wages of over $1, 070. 00 equals no benefit. 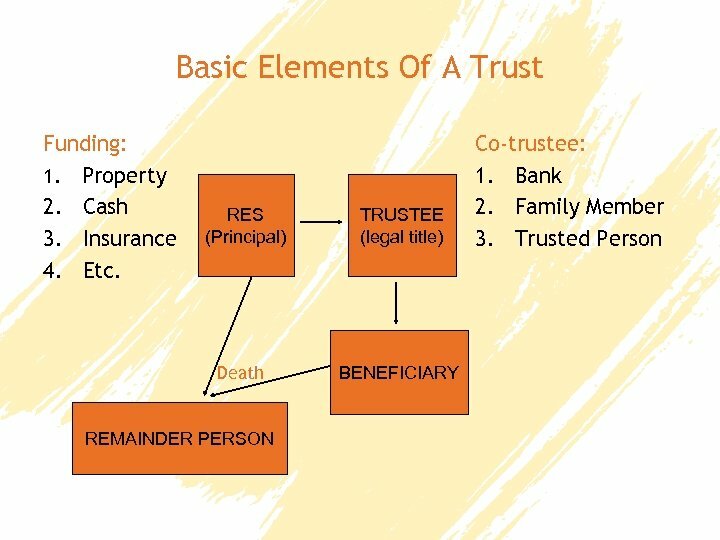 Trial Work Period (TWP) – allows consumer unlimited earnings during a 9 -month period, either consecutive or non-consecutive, while still maintaining a full benefit. TWP is triggered at $770 -$1069 of gross wages during a month. 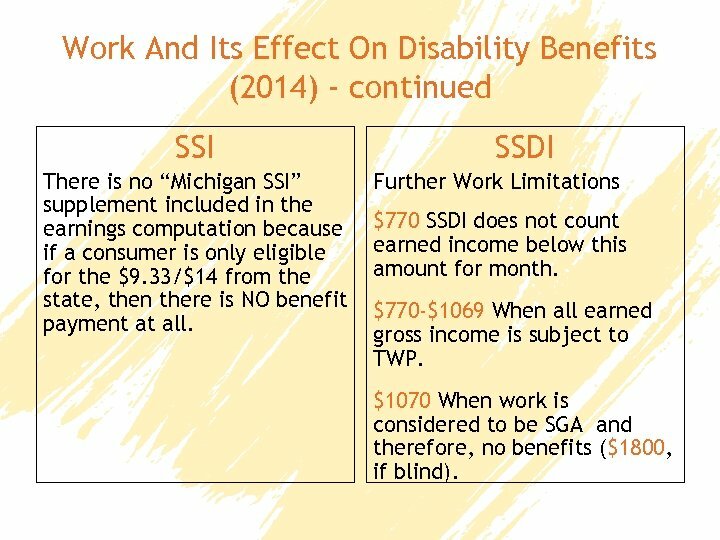 Work And Its Effect On Disability Benefits (2014) - continued SSI There is no “Michigan SSI” supplement included in the earnings computation because if a consumer is only eligible for the $9. 33/$14 from the state, then there is NO benefit payment at all. SSDI Further Work Limitations $770 SSDI does not count earned income below this amount for month. 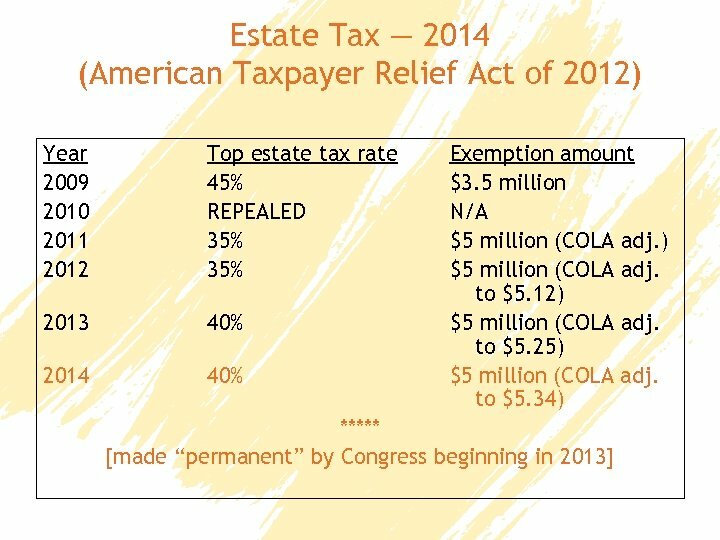 $770 -$1069 When all earned gross income is subject to TWP. $1070 When work is considered to be SGA and therefore, no benefits ($1800, if blind). 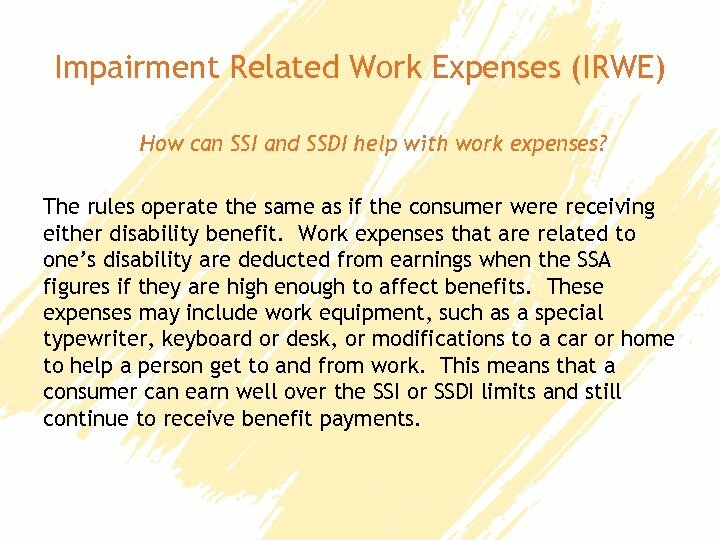 Impairment Related Work Expenses (IRWE) How can SSI and SSDI help with work expenses? The rules operate the same as if the consumer were receiving either disability benefit. Work expenses that are related to one’s disability are deducted from earnings when the SSA figures if they are high enough to affect benefits. These expenses may include work equipment, such as a special typewriter, keyboard or desk, or modifications to a car or home to help a person get to and from work. This means that a consumer can earn well over the SSI or SSDI limits and still continue to receive benefit payments. 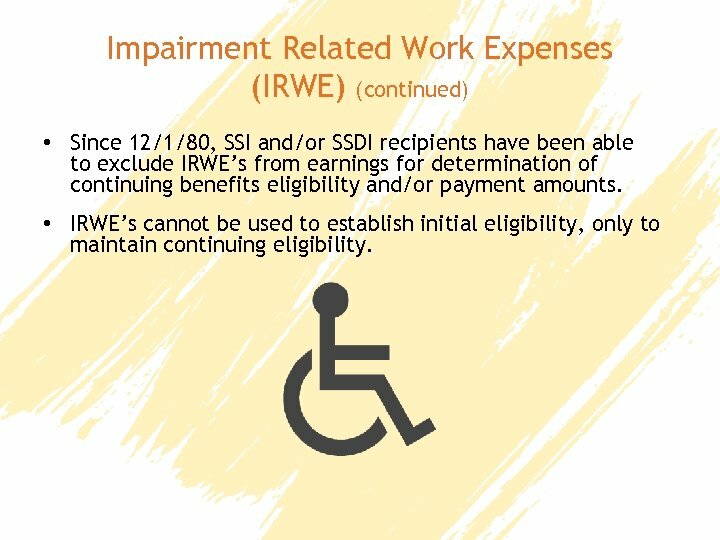 Impairment Related Work Expenses (IRWE) (continued) • Since 12/1/80, SSI and/or SSDI recipients have been able to exclude IRWE’s from earnings for determination of continuing benefits eligibility and/or payment amounts. • IRWE’s cannot be used to establish initial eligibility, only to maintain continuing eligibility. 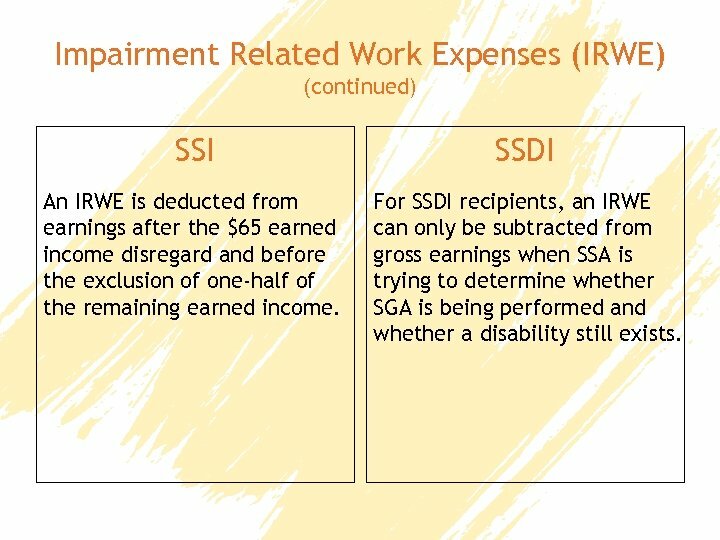 Impairment Related Work Expenses (IRWE) (continued) SSI SSDI An IRWE is deducted from earnings after the $65 earned income disregard and before the exclusion of one-half of the remaining earned income. For SSDI recipients, an IRWE can only be subtracted from gross earnings when SSA is trying to determine whether SGA is being performed and whether a disability still exists. 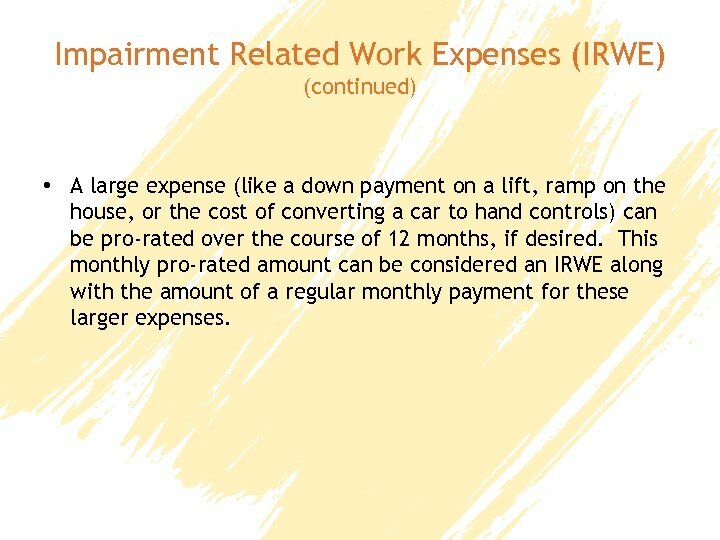 Impairment Related Work Expenses (IRWE) (continued) • A large expense (like a down payment on a lift, ramp on the house, or the cost of converting a car to hand controls) can be pro-rated over the course of 12 months, if desired. This monthly pro-rated amount can be considered an IRWE along with the amount of a regular monthly payment for these larger expenses. 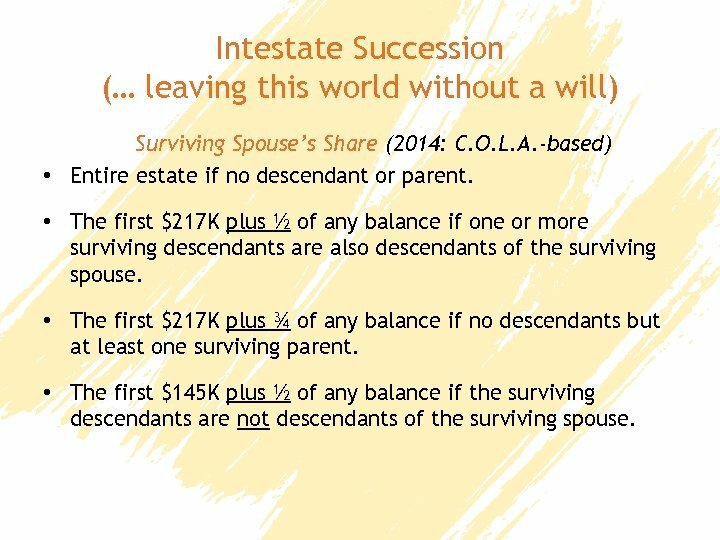 Intestate Succession (… leaving this world without a will) Surviving Spouse’s Share (2014: C. O. L. A. -based) • Entire estate if no descendant or parent. 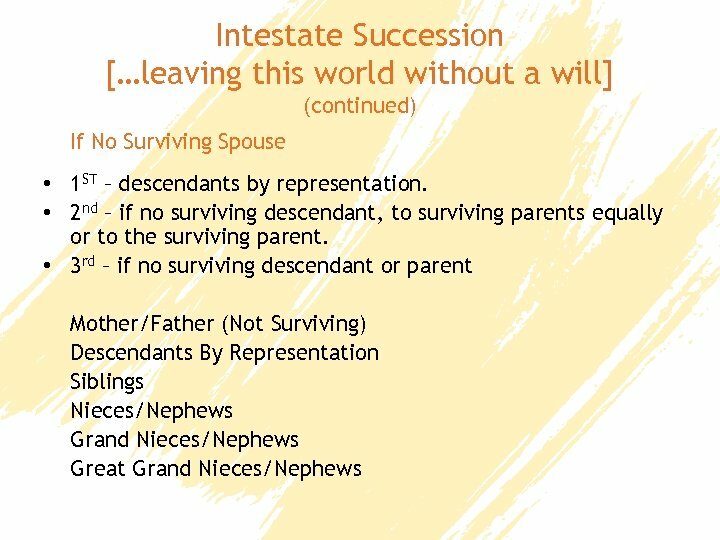 • The first $217 K plus ½ of any balance if one or more surviving descendants are also descendants of the surviving spouse. • The first $217 K plus ¾ of any balance if no descendants but at least one surviving parent. • The first $145 K plus ½ of any balance if the surviving descendants are not descendants of the surviving spouse. 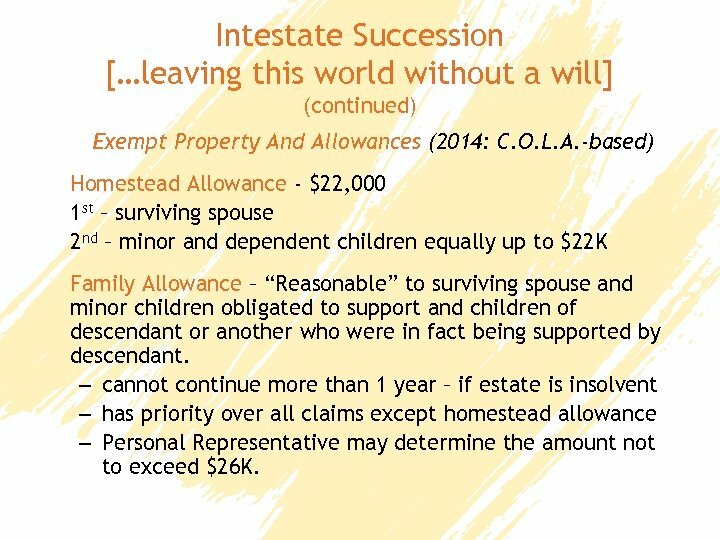 Intestate Succession […leaving this world without a will] (continued) Exempt Property And Allowances (2014: C. O. L. A. 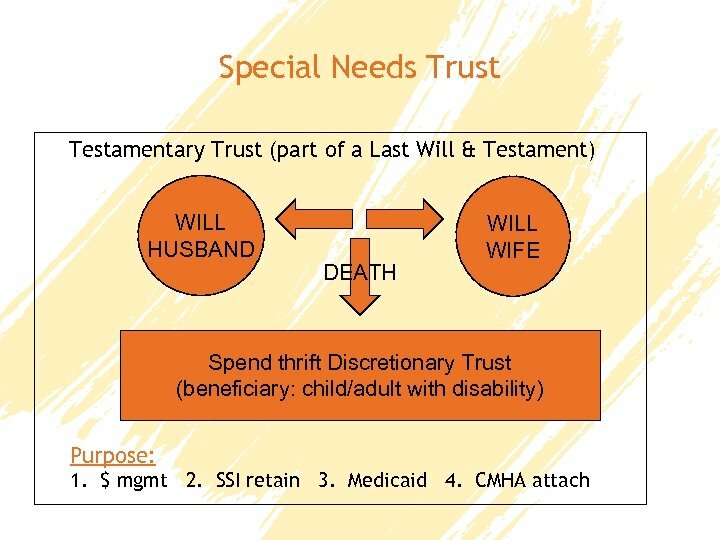 -based) Homestead Allowance - $22, 000 1 st – surviving spouse 2 nd – minor and dependent children equally up to $22 K Family Allowance – “Reasonable” to surviving spouse and minor children obligated to support and children of descendant or another who were in fact being supported by descendant. 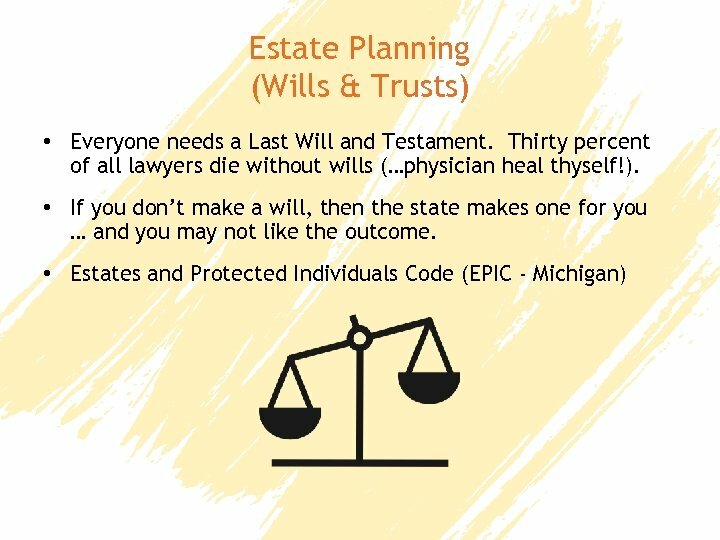 – cannot continue more than 1 year – if estate is insolvent – has priority over all claims except homestead allowance – Personal Representative may determine the amount not to exceed $26 K.